E. F. Schumacher's archives consist of manuscripts, articles, memorabilia, and lecture and background notes, which can be viewed at the Schumacher Center Library. 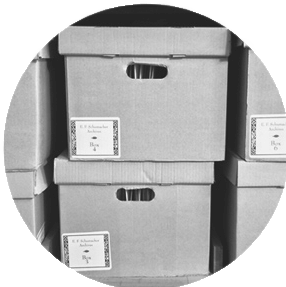 Schumacher’s archives were professionally organized by his daughter Barbara Wood, author of E. F. Schumacher: His Life and Thought (NY: Harper & Row, 1984). They include articles written by Schumacher himself, as well as copies of Small Is Beautiful in many languages, documentary film productions about him, his lecture and background notes, and his awards, medals, and photographs. The collection has been computer-indexed and will be scanned and made available to scholars online in the future. 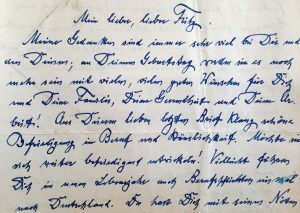 LEFT: Professor Schumacher's letter to his son Ernst Friedrich Schumacher on August 11, 1950 expressing his good wishes for his son's family, health, and work on the occasion of his birthday, and hopes that his work will bring him back to Germany. To isolate and search E. F. Schumacher's Archives, use the search term "E. F. Schumacher Archives." Searching for Publications. Many of E. F. Schumacher's essays and articles were published in popular economic journals, such as Resurgence, and can be searched on the Schumacher Center Library Catalog using the key term "P. SCHUM AUTH". Access documents. In recognition of the uniqueness of the contents of E. F. Schumacher’s personal archives, we are planning on uploading each individual document online to provide researchers with PDF-format access. Until the completion of the project, documents are only available in their summary form.